Are you between the ages of 18 and 30? Do you like new challenges? Would you like to learn more about another country and culture while completing an internship to increase your skills? If the answer to these questions is yes then you should consider taking part in an EVS project. The European Voluntary Service (EVS), as part of the Erasmus + programme, offers eligible candidates the chance to take part in projects abroad. EVS offers young people (from 18-30) the opportunity to volunteer for up to 12 months in another country within or outside of the EU. It affords volunteers the chance to make a strong contribution to the daily work of host country organizations and benefits local communities as well as being a terrific chance for volunteers to develop skills and experience life in a different country. EFHR has offered university students and young professionals the chance to volunteer at our organization for a number of years and in 2014 our organization became an official member of the European Voluntary Service (EVS) network. 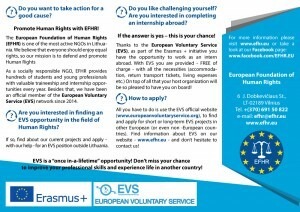 To apply all you need to do is check out the EVS official website (www.europeanvoluntaryservice.org) to find short-term or long-term EVS opportunities in European – or even non-European – countries. When you become an EVS volunteer as part of the Erasmus + initiative you will receive: free accommodation, travel to and from your host country, living expenses, the chance to gain valuable skills and an opportunity of a lifetime! On top of all that your host organization will be so pleased to have you on board – EVS candidates make a real and lasting contribution to the countries they volunteer in! Read up about EVS on our website (www.efhr.eu) and take a look at our Facebook page – www.facebook.com/EFHR.EU. You can also watch the video to discover what EVS is all about. Don’t miss out on this once-in-a-lifetime chance!